Home / Blackpool 2018 Winners – Congratulations Arunas Bizokas and Katusha Demidova! Blackpool 2018 Winners – Congratulations Arunas Bizokas and Katusha Demidova! Katusha Demidova and Arunas Bizokas are an aspiring Standard Ballroom professional dancer’s dream come true. The couple took the title at Blackpool Dance Festival for the 8th year in a row! Katusha and Arunas are the current World Professional Ballroom Champions, British Open Champions, United Kingdom Champions, International Champions, and 3 times United States Champions. 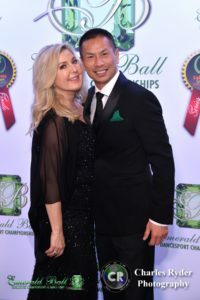 From the beginning of their dance partnership, Katusha and Arunas took the Dancesport community by storm. One month into their dance partnership they won the Ohio Star Ball. Two months in, they were competing in the United Kingdom Open Championships. There they placed second among the top dancers of the world. By September of 2009, after dancing together for only two years, they won their first World Championship title. The couple draws your eyes with their irresistible charm and a chemistry that can’t be faked. Katusha and Arunas now run Rogers Dance Center in Hackensack, New Jersey. The gorgeous dance studio where they teach everything from social dancing to dancesport competition training. Katusha and Arunas continue to improve and learn their dancing and pass on their wisdom and knowledge to students of all age. Congratulations on winning first place in Blackpool for 8 years in a row, to one of the most loved and well respected dance couples around!